Observing Uranus and Jupiter using iSHELL! After arriving in Hawaii, me and Henrik had some food at the famous Ken’s pancake house and headed to our hotel. I had grilled cheese sandwich which set a theme for my vegetarian meals in Hawaii! Even though I’d slept most of the journey from LA to Hilo, I fell asleep early and ended up waking up around 4am – so begins the random sleeping pattern! I made the most of waking up early and went for a sunrise swim at Coconut Island, about 5 minutes walk from the hotel. Mauna Kea and Mauna Loa were looking great in the early morning sun without a cloud in the sky – a good omen for our upcoming observations. A cloudless sunrise over Mauna Kea from Coconut Island! After having another cheese themed breakfast at Ken’s we checked out of the hotel and got a taxi to the IFA. I drove, which was actually fun compared to my last trip to Hawaii in Feburary when I was so terrified to drive! There were some sporadic road works along the saddle road (the road in between Mauna Kea and Mauna Loa which leads to the other side of the island) and it was a bit confusing going off road onto a dirt track and nagivating cones – at least it explains why the telescope car was even more dirty than usual! Eventually we arrived at Hale Pohaku and it was a really nice feeling to be back on the mountain! I had a quick hike up the tourist cindercone before coming down for dinner which was (you guessed it!) cheese and bread themed! It was our acclimatisation night so I went to bed at 8pm and woke up at 4am to try and make myself somewhat nocturnal. I did some PhD work and then went on a classic sunrise hike to my favourite sunrise cindercone, where I had fun taking pictures of the super moon. A great place to catch sunrise on the mountain. The super moon sets into Mauna Kea’s shaddow. Sunrise on the mountain – looking excellent as usual! After breakfast, me and Henrik hiked to the red cindercone which was about a 6 mile round trip. I’d completed this hike during my trip in 2015 and its a nice walk along a dirt track and then an adventurous scramble over some a’a lava (the lovely sharp and spikey lava!). When we arrived at the base of the red cindercone the clouds began to draw in and completely engulfed us as we climbed up the slope. It was really windy and got very cold (on the scale of one to this should be warmer because we’re in Hawaii) but our efforts paid off and we got to the top of the red cindercone and saw a rainbow. Once back at Hale Pohaku there was more cheese and bread for lunch and then nap time until observing. We headed up from Hale Pohaku to IRTF in the car with one of the telescope operators. Henrik had already observed Uranus with the new instrument iSHELL in October, so he’d already figured out how to use it. Things started to make more sense for me as Henrik began observing Uranus. The weather was clear and so Henrik got loads of good Uranus data. Unfortunately I didn’t feel so great and got a headache and I wasn’t having the best time by the end of the observing run. I was glad to head back down to Hale Pohaku for some extra oxygen and sleep! After spending most of the night and a lot of the day trying to sleep I still wasn’t feeling especially good by dinner time. For some reason this trip the altitude really got to me. We decided that Henrik would go up to IRTF to observe Uranus, come down for a power nap and then we’d both go back up at 3am for the Jupiter observations. This way hopefully I wouldn’t get another headache and could have a cheeky nap so that I’d be fine to do the driving. I watched Henrik observing Uranus from the IRTF office and did some prep for the Jupiter observations. After nap time, I drove me and Henrik from Hale Pohaku back up to IRTF on the summit. I was a little nervous using the new instrument and I was really glad Henrik was there to help me! We also Skyped with someone who works at the Institute for Astronomy in Hilo and he was super helpful, giving us loads of extra information about the instrument. The weather was really great again but Jupiter was very low down near to the horizon, so we started off doing the calibrations and taking a star spectra, which we would use later to calibrate the brightness. Once Jupiter had climbed higher in the sky we could start observing. Ideally I’d like to guide on an off-axis guide star, which means the telescope will hold nice and steady on Jupiter. Unfortunately the telescope operator couldn’t find one so we used used the rates at which Jupiter is known to move across the sky. This didn’t seem to work out very well, maybe because Jupiter was still relatively close to horizon, Jupiter seemed to be jumping around a lot between images – we had to roll with it though as it was our only option! We tried out several different exposure times for our spectra and made the instrument look at the northern lights and the equator. We also tried running a macro (a computer program which commands the telescope) which kind of worked after some teething problems. I guess the silver lining of Juno’s orbiting not changing as expected, is that these observations weren’t super high pressure as we weren’t taking aurora data at the same time as Juno. We got to test different settings and at the same time collect data which can use for science! Once we finished observing Jupiter, we went to check out iSHELL! After stopping to take pictures of the beautiful sunrise, we headed back down to Hale Pohaku for breakfast and to pack up and head down to sea level. Henrik wasn’t running on much sleep and we were both in need to some sun, sea, sand AND oxygen! Sunrise drive down the mountain after observing: Spot the Volcanoes rising out of the clouds – you can see Kohala and Hualalai (Big Island) and Haleakala (maui) and a Mauna Kea shaddow! After using a brand new instrument and collecting some excellent data we’d definitely earnt ourselves some beach time. We collected a rental car from the airport and Henrik drove us round the senic route North of the Island to one of his favourite beach parks only to find it was closed. This was devasting news for Henrik and we had to settle for another one of Hawaii’s amazing beaches… Once we’d had a couple of swims in the sea we headed to the hostel which was super posh! It was a very fancy establishment which provided bathroom towels as well as beach towels! This little geko friend decided to run up my leg twice! We then spent the afternoon on the beach – a classic sea level activity! For my final day we diverged from the beach theme and went for another classic Hawaiian theme of lava, with a detour to see turtles. The lave lake in the Kilauea caldera. We started our lava tour at the national park to see the lava lake. It was awesome to see the lava at the edge making a small fountain! Then we drove to the end of the road (the road that is blocked by lava! ), parked up and began our 3 or more mile trek to the point that the lava flow was entering the sea. The path was an easy going track which lead us over the lava which would have been created in the last decade or so. Surprisingly we passes a couple of shack like houses where people are actually living – I guess it is the cheapest land you can buy! Ahead the steam clouds could be seen following the lava flow down the hillside and a huge plume of steam was errupting where the lava met the sea. The rangers of the National Volcano Park had put up a rope to show that you weren’t allowed to walk any further down the road to stop us tourists falling into lava! The lava making different channels down the hillside. You can’t see the molten lava as it travels in tubes below the surface and it covered by a roof of solidifed lava. Following the rope, we were able to walk a little way out towards the lava flow, across the pahoehoe lava to see a little skylight. You could see through the roof of the lava tube and into the glowing interior. You couldn’t actually see the molten lava itself, it was more of a glowing hole but it was pretty amazing to think about the lava potenitally flowing beneath our feet! I didn’t manage to get a good picture as it was windy and I didn’t have a tripod but imagine a glowing hole! By this time the sun had very much set, so we found our way down to the viewing area from which we could see the lava flowing into the water. There was a lot of steam and in the day time this plume didn’t look like much but in the dark the steam was lit up from the lava spilling into the sea below. Occasionally there would be a tiny explosion of lava as a wave came in and a spattering of lava would become visible. It was super mesmorising to watch and we didn’t really want to leave… except we knew we had about 3 miles to walk back to the car! The plume of steam from the lava entering the sea is lit up at night by the glow lava beneath! And this is what you might have seen if there was less steam and more daylight and more helicopters and more prosessional photographers… credit: HVO / USGS. Soon into our hike the rain came… And it didn’t let up. It wasn’t cold but by the end of the 3 mile walk… we were soaked to the skin and feeling pretty fed up of walking in the pitch black. I was super happy to be back at the car and able to change into dry clothes although, having avoided the mosquitos all week they finally got me just in time before my departure! We drove back to Hilo, checked into the hotel and headed to Ken’s for dinner again. The next day was home time for me. 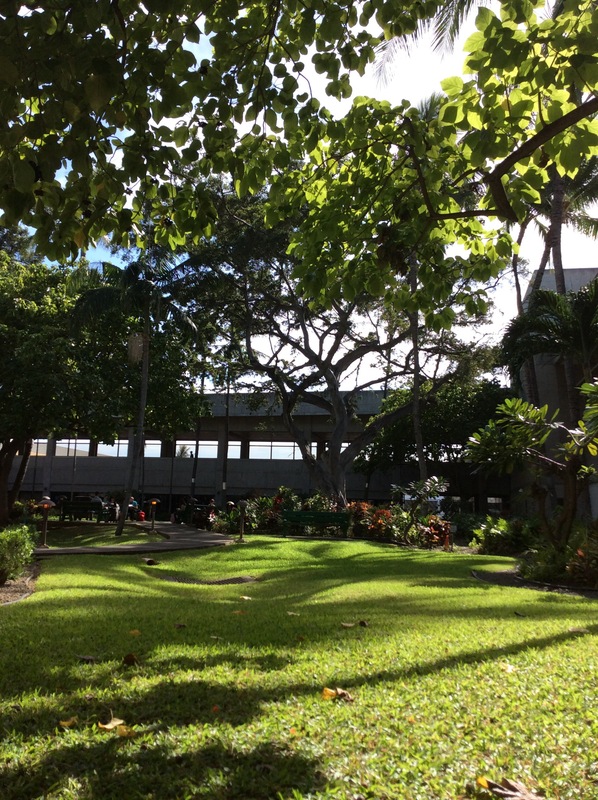 Henrik dropped me off at the airport and I went on my way home of course via the airport garden at Honolulu! One last view of the volcanoes on Big Island and Maui 🙂 – bye bye Hawaii!! Previous Previous post: Back to Mauna Kea! Next Next post: Observing inbetween the clouds!